Windows 8 UX Pack 2.0 is a free Tool to Transform Windows 7 into Windows 8. Windows 8 UX Pack 2.0 does not modifies any system files. Windows 8 UX Pack 2.0 is developed by windowsx aka Mr. Windows x. You can run this program again to re-configure or uninstall. Tasks will be done instantly. It is a ZIP download, 12.5 MB in size. This Article Has Been Shared 4280 Times! Windows 8 Build 7989 Boot Screen for Windows 7 is a free tool to customize windows 7 boot screen. Mac OSX Spaces for Windows is a desktop customization software much like Mac spaces which allows to work like six different sides of cube. Aero Adjuster adds a bit of Windows 8 functionality to Windows 7. It sits in the tray, automatically detects when you change your wallpaper. 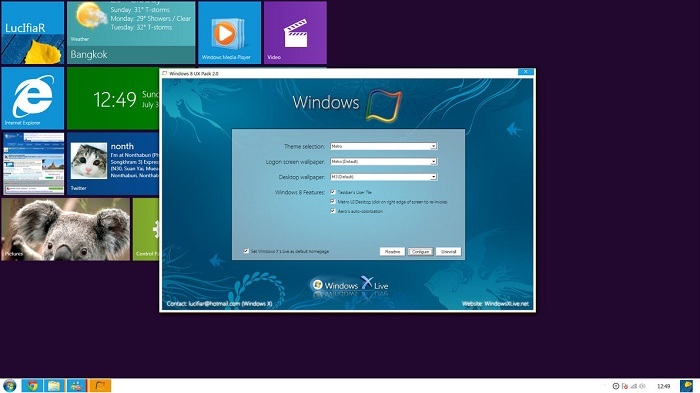 Cite this article as: Abhishek Ghosh, "Windows 8 UX Pack 2.0 : Tool to Transform Windows 7 into Windows 8," in The Customize Windows, July 9, 2011, April 21, 2019, https://thecustomizewindows.com/2011/07/windows-8-ux-pack-2-0-tool-to-transform-windows-7-into-windows-8/.